SOURCE: AP/JOSH REYNOLDS A significant proportion of American women leave scientific careers between earning their Ph.D. and winning tenure-track positions. Many of these "leaks" in the pipeline are the result of decisions to start families. Changes to federal and university policy can stem the losses, say the authors of a new report. Download the full report at the CAP website. When Mary Ann Mason was graduate dean at the University of California, Berkeley, a frequent question she heard from women graduate students was “when is a good time to have a baby?” For women in academic science careers, the conventional wisdom was that waiting until she had achieved tenure was the best approach. In 1985, the national average age of scientists winning tenure was 36. But by 2003, it was over 39. “So it’s increasingly poor advice to wait until you get to tenure,” she says. Her belief is that women researchers should be able to have children whenever they want, and her new report, “Staying Competitive: Patching America’s Leaky Pipeline in the Sciences,” co-authored with colleagues Marc Goulden and Karie Frasch, explains the work-family policies that are driving women out of the academic pipeline. Their data, taken from extensive surveys of graduate students and postdoctoral researchers within the University of California system, shows that work-life issues, and particularly decisions about when to get married and when to have children, account for the most significant loss of academic scientists in the pipeline between Ph.D. and tenured positions. “The leak is almost entirely, or at least due primarily to family formation,” said Mason, who is currently a professor and co-faculty director of the Berkeley Law Center on Health, Economic, and Family Security at the UC Berkeley. To discuss the report and the choices facing women scientists along their professional pathways, Mason, Goulden, who is Director of Data Initiatives in Academic Affairs at Berkeley, and Association of American Universities President Robert Berdahl joined Science Progress for a podcast conversation. But both women and men agree that research positions at universities are the most family-unfriendly career choices among a range of options for scientists. “We have a process in which a large number of very talented scientists… are discouraged about a career in science because of some of the demands that it puts upon them,” said Berdahl. The Obama administration has made investment in science an administration priority, and as Mason points out, losing those women scientists who are so far along the career pathway represents a significant loss of federal grant funding. Training for a young scientist from graduate school through a postdoc can total close to $500,000. So it’s the responsibility of both federal grant-making agencies like the National Institutes of Health and the National Science Foundation, as well as research universities, to develop and share policies that remove the tension in hiring decisions for PIs and create family-friendly environments for scientists aiming for the top of their profession who also want to start families. 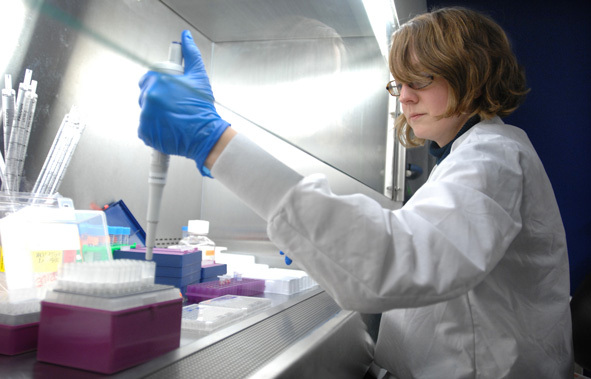 The report suggests policies that provide responsive benefits for all classes of researchers, from graduate students up through full professors; supplemental funding to offset productivity losses when scientists go on family leave; and flexibility in the lock-step timing of the academic science career path. Andrew Plemmons Pratt is the managing editor at Science Progress. [capaudio url="http://www.scienceprogress.org/wp-content/uploads/podcasts/women_in_science.mp3"] When Mary Ann Mason was graduate dean at the University of California, Berkeley, a frequent question she heard from women graduate students was "when is a good time to have a baby?" For women in academic science careers, the conventional wisdom was that waiting until she had achieved tenure was the best approach. In 1985, the national average age of scientists winning tenure was 36. But by 2003, it was over 39. "So it's increasingly poor advice to wait until you get to tenure," she says. Her belief is that women researchers should be able to have children whenever they want, and her new report, "Staying Competitive: Patching America’s Leaky Pipeline in the Sciences," co-authored with colleagues Marc Goulden and Karie Frasch, explains the work-family policies that are driving women out of the academic pipeline. Their data, taken from extensive surveys of graduate students and postdoctoral researchers within the University of California system, shows that work-life issues, and particularly decisions about when to get married and when to have children, account for the most significant loss of academic scientists in the pipeline between Ph.D. and tenured positions. "The leak is almost entirely, or at least due primarily to family formation," said Mason, who is currently a professor and co-faculty director of the Berkeley Law Center on Health, Economic, and Family Security at the UC Berkeley. To discuss the report and the choices facing women scientists along their professional pathways, Mason, Goulden, who is Director of Data Initiatives in Academic Affairs at Berkeley, and Association of American Universities President Robert Berdahl joined Science Progress for a podcast conversation. These decisions, influenced by the family-unfriendly policies at many research institutions, account for the fact that while women now receive more than half of the Ph.D.s in science and engineering fields, they are under-represented in comparison to men at in the faculty level of their academic fields. According to the report women comprised "63 percent and 54 percent of NIH and NSF’s predoctoral awards in 2007, respectively, but just 25 percent and 23 percent of the competitive faculty grants awarded in the same year." But both women and men agree that research positions at universities are the most family-unfriendly career choices among a range of options for scientists. "We have a process in which a large number of very talented scientists... are discouraged about a career in science because of some of the demands that it puts upon them," said Berdahl. The Obama administration has made investment in science an administration priority, and as Mason points out, losing those women scientists who are so far along the career pathway represents a significant loss of federal grant funding. Training for a young scientist from graduate school through a postdoc can total close to $500,000. For those women who do decided to start families while moving through the career pipeline, their odds of winning tenure are significantly diminished in comparison to their male counterparts. Married women with Ph.D.s who have young children are 35 percent less likely to get a tenure-track position than men with young children. The necessary time off those mothers need for childcare responsibilities can put principal investigators in charge of research grants in tough positions. "They're definitely caught between a rock and a hard place on this issue," explains Goulden, "because if their researchers have children and go on leave, that results in a loss of productivity to their grant. And as it stands, for the most part, they receive no additional supplemental funding in that situation." So it's the responsibility of both federal grant-making agencies like the National Institutes of Health and the National Science Foundation, as well as research universities, to develop and share policies that remove the tension in hiring decisions for PIs and create family-friendly environments for scientists aiming for the top of their profession who also want to start families. 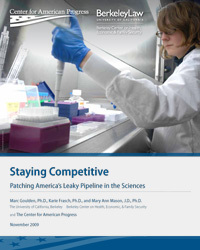 The report suggests policies that provide responsive benefits for all classes of researchers, from graduate students up through full professors; supplemental funding to offset productivity losses when scientists go on family leave; and flexibility in the lock-step timing of the academic science career path. Andrew Plemmons Pratt is the managing editor at Science Progress.